The first BioUsahawan 2019 kicked off with the product launch of six BioNexus Status companies, an exchange of documents and the launch of Bioeconomy Community Development Programme (BCDP) 2.0 model. A joint collaboration between the Ministry of Agriculture & Agro-based Industry (MOA) and Malaysian Bioeconomy Development Corporation Sdn Bhd (Bioeconomy Corp) the event is seen as a strategic entrepreneurship platform to advance Malaysia’s overall agriculture sector towards becoming more modern, sustainable and competitive. Deputy Minister of MOA, YB Tuan Sim Tze Tzin – reading on behalf of the Minister of MOA YB Dato’ Salahuddin bin Ayub – said that the launch of the products was a testament to how the application of modern bio-based technologies in agriculture can bring life and added-value to our homegrown products. 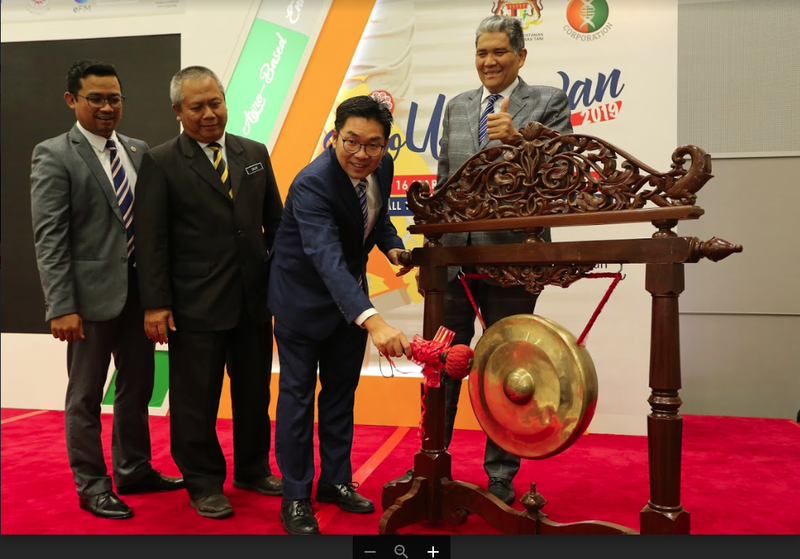 “At BioUsahawan 2019, consumers can see that Malaysian agro and bio-based products are of high quality, modern, fulfills safety requirements and on par with international standards. Not only do we want to increase confidence among consumers, we want them to be proud of our local products and to support our local businesses. We hope it will change people’s perspective about homegrown agro and bio-based products and redefine what it means for products to be ‘made in Malaysia’,” he said during the opening ceremony of BioUsahawan here today. “These launches and exchange of documents underline what we want to achieve through BioUsahawan 2019, which is to empower and create advanced, competitive entrepreneurs in Malaysia. We want to provide our local entrepreneurs with the right tools, platforms and mindset for them to grow and advance, not just in Malaysia but internationally as well,” added Dr. Shuhaizam.